When you zipline with us in Oahu, Hawaii, you will be exploring one of the most beautiful places on Earth. Our zipline tour has the longest ziplines in Oahu, ranging from 500 feet to nearly half a mile long! 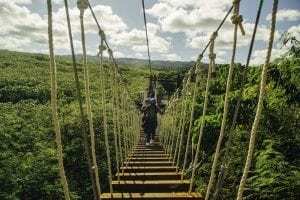 The ziplines offer panoramic views of the ocean and mountain views of the North Shore. You’ll start 410 feet above sea level, overlooking the North Shore’s famous beaches, mountains, and farms. Most people visiting Oahu drive up to see the beautiful scenes of the North Shore, but our tour gives you a bird’s eye view from the mountains! Our Oahu zipline tour is so much more than just ziplines. It offers plenty of adventure that will make your first time even more exciting. The tour begins with an ATV ride to the top of the mountain. The ride lasts about 10 minutes. You’ll travel for 2 miles by farms, through the jungle, and up the mountainside. It provides an incredible opportunity to see all the different inland landscapes of Hawaii. In addition to the ATV ride, you’ll encounter rappels, sky brides, scenic boardwalks, and of course a few surprises along the way. 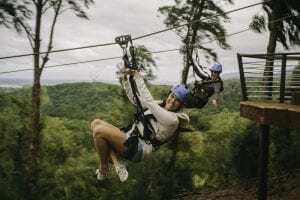 The best adventure of all is our 8 side-by-side zipline runs that let you see the breathtaking views with the person of your choice beside you. When you zipline with us, we allow you to explore a working farm and experience Hawaiian culture in a new way. Keana Farms produces over a million pounds of product each year. As you soar over it, you’ll see papaya, apple bananas, taro, cherry tomatoes, and more. You’ll even be given the opportunity to taste some of the fruit! Along the way, we’ve set up educational exhibits that change the way you look at Hawaii and help you learn more about Hawaiian history, culture, and farming. It’s both fun and educational! If you’ve never been ziplining before, it’s normal to be a little nervous. Whether you’re afraid of heights or nervous about rappelling for the first time, we help you every step of the way. It also helps for you to know that safety is our first priority. Our staff takes care of you from start to finish, as well as all necessary safety operations. All of our equipment is inspected before and after each use, and we even use a special braking system, the ZIPKEA. This eliminates riders having to hand-brake or drag themselves over spans on cable. Our trained guides accompany you on your zipline tour not only to help ensure your safety, but to make your experience more fun. They’ll keep you laughing and help you overcome any fears, as well as teach you more about the area! All of our guides have undergone extensive safety training and continue going through trainings to maintain a high level of safety. All you have to focus on is enjoying the experience! Learn more about our mission at CLIMB Works Keana Farms, and start planning your trip to try our Oahu zipline tour for the first time!